Casinos truly care about giving money away. It’s where you go to give away your money. There’s a casino billboard along a stretch of highway around here. It promises 95% payback on its slot machines. What you get is the privilege of handing the casino a buck and receiving 95 cents back. Isn’t that nifty? You make them a nickel richer and yourself a nickel poorer. You could have just hand them the nickel in the first place, but they like to do it as a dollar exchange instead. It makes them look generous: 95% payback! Perhaps you think this is all in good fun and, besides, there’s always a chance you’ll be the big winner! Then I have some news for you. By hoping to win, you are also hoping someone else loses. The reality is that in order for the casinos to make money – and they do, since they only give back 95 cents for ever dollar given them – then a lot of people have to lose. Some of those people lose big. Your winning jackpot comes at the expense of those people. Not at the expense of the casinos (remember they always take their 5% off the top), but at the expense of others who walked in hoping they’d win at your expense just like you hoped you’d win at theirs. 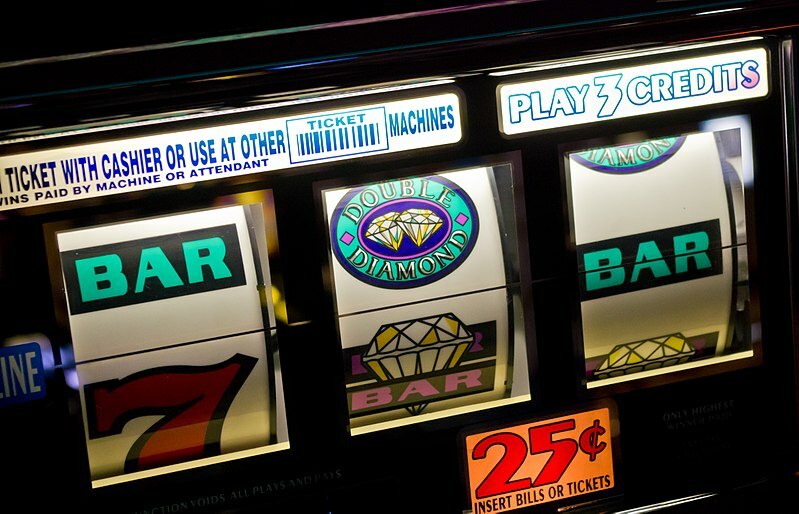 Some people justify gambling by saying that it’s all right in moderation and among adults. If you want to sit at a friendly poker game where everyone relies on their own skill and the luck of the draw and no one wagers more than they can afford to lose, perhaps you’re right. But these casino billboards advertise something different. They advertise that they are going to take your money from you. That’s what 95% payback means. It’d be a scam if they weren’t so brazen in the fact that they promise to take your money from you. Putting my hope in God who richly provides sounds better to me. That’s where true riches can be found. And unlike the casinos, the odds aren’t stacked against me in God’s house. This entry was posted in Uncategorized and tagged casinos, gambling, money, slot machines. Bookmark the permalink. 9 Responses to Casino Promises a 95% payback – and it’s not a scam! Thanks for this Tim. Not everyone who tries crack gets addicted but that doesn’t lessen the devastation of crack on the lives of the many who do get addicted. Same goes for gambling. True, Karen. Addictions are addictions, whether substances or actions. It’s amazing how the brain responds similarly in each case. Thanks for this post, Tim. It caused a good conversation at our breakfast table! Did you breakfast on pizza muesli with pepperoni yogurt? My Dad always said the best way to double your money is to fold it in half and put it back in your wallet. It’s a corny cliché, but true. And people conveniently forget that their big win is always financed with other people’s money. Always. You are raising them well! certain you’re finding all of your reductions.